Happy Halloween– BZH (Breton) extravaganza! How It’s New York: New York just loves this holiday, it’s spooky, it’s autumnal, it’s flamboyant. How It’s Irish: Samhain is a Celtic holiday, and this Celtic Fest includes Breton and Scottish music on the bill! AND there’s a screning of Beautiful People by Sam Adelman, a doc about the Dempsey’s Session! 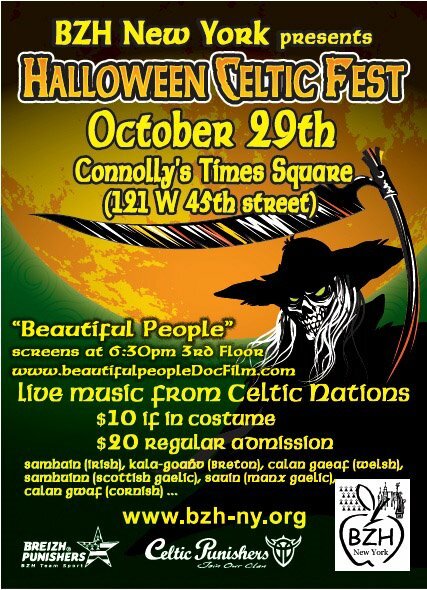 BZH New York invities you to join us on October 29th at 6:30pm for an evening of Celtic celebration featuring exciting live music from numerous celtic nations. Many forms of Celtic music and dance will create a ceilidh, fest noz like atmosphere to properly ring in the Celtic New Year. Where: Connolly’s Times Square (121 W 45th street) from 6:30pm to 2am. Celtic New Year traditionally celebrated by many celtic people, Samhain (Irish), Kala-Goañv (Breton), Calan Gaeaf (Welsh), Samhuinn (Scottish Gaelic), Sauin (Manx Gaelic), Calan Gwaf (Cornish). Don’t miss this unique musical event!!! Don’t know anything about the music of Brittany? Listen to our podcast with BZH’s Charles Kergaravat from May, when the group was celebrating St. Yves Week and Fez Nost.